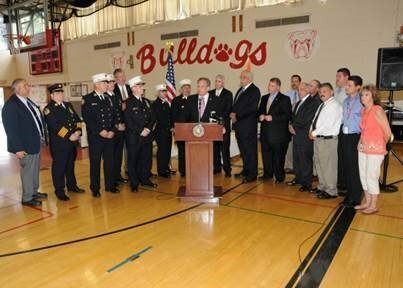 Levittown, NY - July 30, 2015 - Nassau County Executive Edward P. Mangano was joined today by Legislator Dennis Dunne and the Superintendent of Island Trees School District Dr. Charles Murphy in announcing plans to create an emergency shelter for families of first responders at Island Trees High School in Levittown. The agreement between Nassau County and the Island Trees School District will enable families of first responders to be located at a safe central location during a declared emergency. This shelter only becomes operational once there is a declared emergency necessitating residential evacuations. Island Trees High School is an ideal shelter location as it is located in central Nassau County, away from vulnerable shorelines with excellent access to main roads and major thoroughfares. • Create and/or update your Family Emergency Plan. • Develop a Family & Friends Sheltering Plan in the event they are asked to evacuate their home. • Familiarize yourself with Evacuation Routes from Coastal Evacuation Areas. • Assemble an Emergency Go-Kit, keep it by their front door in a duffel bag and include enough supplies for everyone in the household for 5 days. • Safeguard your pets by preparing a Pet Go-Kit. For more information, please visit the Nassau County Office of Emergency Management (OEM) here. Subject: LongIsland.com - Your Name sent you Article details of "Mangano Announces Emergency Shelter For First Responder Families At Island Trees High School"